Save time – pay online! It’s free and easy to get started. Find answers to your questions about the type of credit cards we accept, automatic payments, multiple payment accounts, and more. When will my payment be debited from my bank account? If you pay by bank account, the funds for the payment are debited from your account on the scheduled payment date. Keep in mind that you should always have funds available to cover the payment on that date. Why don't I see all my payments in my payment history? Big Bend customers will begin to see their payment history as payments are made through the new billing system. In your online account, you will only see payments generated through our Monthly Online Payment system ("My Account"). Payments made through our one-time payment system, in person, by mail or over the phone will not be reflected on the "Payment History" page. If you pay by bank account, payments will post to your water account within 2-3 business days. If you pay by credit card, payments will post to your water account within 1-2 business days. Yes. This option allows you to set your bill to be paid in full either as soon as the bill arrives or on the due date each month. Once registered for Monthly Online Payments, you can sign up for this feature under the "Payments" section. When you sign up for automatic payments, you will be asked to set a limit for how high of a bill you wish to pay through automatic payments. If you receive a bill that is higher than your stated limit, you will receive an email notice alerting you that your bill was not paid through automatic payments. I need my payment to post immediately. What payment process should I use? If you need your payment to post immediately, please pay by phone. Need password or login assistance? Get answers to your questions about creating and retrieving your username or password. If you have forgotten your password, go to My Account and click the "I forgot my username and/or password" link below the Login button. Then, click the "Forgot Password" button. You'll be asked to enter your username or account number. A temporary password will be sent to the email address on file. You will be prompted to create a new password once you log in. How do I retrieve my log in information if I have forgotten my username and password? If you have forgotten both your username and password, go to My Account and click the "I forgot my username and/or password" link below the Log in button. You'll be asked to enter your account number and the last four digits of the primary account holder's social security number or passcode provided by Customer Care. Commercial customers will be required to enter the EIN/tax ID number associated with their business. Your username will be provided and you will be prompted to create a new password. How do I retrieve a forgotten username? If you have forgotten your username, go to My Account and click the "I forgot my username and/or password" link below the Login button. Then, click the "Forgot Username" button. You'll be asked to enter your account number. Your username will be sent to the email address on file. I'm having trouble registering. What could be the problem? There are a few reasons why you might not be able to register. If you are trying to make a one-time payment, you must have received at least one paper bill before your account number will be recognized by the payment system. If you still have a problem registering, call us at 702-298-3113 during regular business hours or email us. Does it cost anything to make payments online? The Las Vegas Valley Water District provides this service free of charge to its customers. If you pay through a financial institution or another company, you might pay a fee for their service. Data Security: We use appropriate administrative, physical and technical safeguards to protect the personal information you share with us. It is important that you protect your password and other personal information to prevent unauthorized individuals from using it online. Although we attempt to maintain the security of this Site and the information you provide to us, please be aware that no security system is completely impenetrable. You acknowledge that the transmission of information over the internet is inherently insecure, and we cannot guarantee the security of data sent over the internet. You are responsible for keeping the password you use for accessing our website confidential; we will not ask you for your password (except when you log in to our website). Automatic sign out: You are automatically signed out of a session if you are inactive longer than 10 minutes. We recommend you sign out immediately after you're finished scheduling and making payments. Choose "Log Off" from the list of available options. User name and password: Your user name and password are unique identifiers that only you should know. If you don't share these with anyone, then no one else can sign onto the Water District's eBill service pretending to be you. What is the difference between "Monthly Online Billing" and "One-Time Payments?" 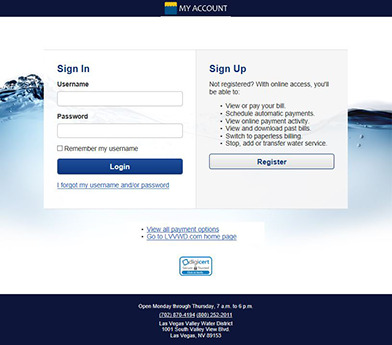 Monthly Online Billing allows you complete online access to your water bill. You can view your bill online and make or schedule payments using your credit card or your checking account. You also can sign up for automatic payments and paperless billing. The One-Time Payment option allows you to pay your bill online with a credit or debit card, or checking or money market account. You won't be able to view your bill with this option. For first time online account sign up, you will need to register an account. Register your online account once you receive your March bill statement and new account number. After inputting your new account number and creating your unique username, use the first 10 digits of your new account number as your temporary passcode to register on MyAccount. You then will be prompted to establish your own secure password. Follow the instructions in the email to return to MyAccount.lvvwd.com. Now you can pay your bill, check your account balance and view your billing and payment history.